Many people think of insects as a nuisance. They don't realize that without them we are doomed. While there is plenty of anecdotal evidence that there are fewer insects than there used to be--older people will remember that a car journey in summertime in the northern hemisphere used to leave your windscreen plastered with dead insects--until recently there have been few studies of insect population declines. "Insects make up about half of all known living organisms. They play key roles in, pollination, nutrient cycling, food chains of birds and other insectivores, and are one of the pillars of our ecosystems. 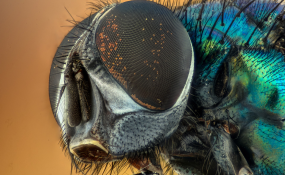 However, the wide use of insecticides, fragmentation of habitats and climate change are placing multiple threats on them, and their populations are under sharp decline," says a January 2019 UN Environment Foresight Brief. "The single most pervasive service provided by insects, and possibly the most undervalued, is their role in developing and maintaining soil structure and fertility," says the brief. A recent study found that insect numbers in west German nature reserves fell by more than 76 per cent from 1973 to 2000. The European Union's Biodiversity Strategy aims to halt the loss of biodiversity and ecosystem services by 2020. Now a new global study of the drivers of insect decline says habitat loss by conversion to intensive agriculture is the main driver of the declines. Agrochemical pollutants, invasive species and climate change are additional causes. "A rethinking of current agricultural practices, in particular a serious reduction in pesticide usage and its substitution with more sustainable, ecologically based practices, is urgently needed to slow or reverse current trends, allow the recovery of declining insect populations and safeguard the vital ecosystem services they provide. In addition, effective remediation technologies should be applied to clean polluted waters in both agricultural and urban environments," says the study. Across the world, more than 40 per cent of insect species are declining and a third are endangered, the analysis found. The rate of extinction is eight times faster than that of mammals, birds and reptiles. The total mass of insects is falling by a precipitous 2.5 per cent a year, according to the best data available, suggesting they could vanish within a century. Lepidoptera, Hymenoptera and dung beetles (Coleoptera) are the taxa (groups of organisms) most affected; four aquatic taxa are imperiled and have already lost a large proportion of species. "The world's insects are hurtling down the path to extinction, threatening a catastrophic collapse of nature's ecosystems," says UN Environment biodiversity expert Marieta Sakalian. "We urgently need to take action on many fronts to stem this decline." The researchers set out their conclusions in unusually forceful terms for a peer-reviewed scientific paper: "The [insect] trends confirm that the sixth major extinction event is profoundly impacting life forms on our planet... Unless we change our ways of producing food, insects as a whole will go down the path of extinction in a few decades... The repercussions this will have for the planet's ecosystems are catastrophic to say the least." UN Environment experts say the report gives pause for thought. "Like the recent report by the Intergovernmental Panel on Climate Change, which stressed that we have about a decade 'to change the way we live', this is a hard-hitting analysis," says Sakalian. "Food systems need to change and remedial measures such as planting of indigenous tree species and rewilding of degraded landscapes need to take place at scale." The impact of climate change on some animals and plants and the phenomenon of phenological mismatches is understood to some extent, but we have little information about the fate of insects, the most diverse group of animals on Earth, in a changing climate. One May 2018 study concludes: "For vertebrates and plants, the number of species losing more than half their geographic range by 2100 is halved when warming is limited to 1.5°C, compared with projected losses at 2°C. But for insects, the number is reduced by two-thirds." Another contributing factor to insect declines could be light pollution. Crop yields could be increased by planting flower strips and hedgerows, providing nesting resources; pesticides could be used in a more targeted way; pollinator diversity could be increased by restoration of seminatural and natural areas; insect conservatories, butterfly farms and exhibits could be set up.